On April 4, 2019, Field Marshal Khalifa Belqasim Haftar ordered his self-styled Libyan National Army (LNA) to move on the capital Tripoli, ahead of planned United Nations-backed talks (to be held at Ghadames on April 14-16) aimed at developing a "road map" towards political reconciliation for the divided country. On the very same day, Government of National Accord (GNA) Prime Minister Fayez al-Sarraj declared a state of emergency over the capital, following the LNA's announcement. As of now, Tripoli is under the protection provided by the forces of the GNA and other militias. However, there are now fears of a renewed civil war in Libya, which has been riven by violence and division since long-time ruler Muammar Gaddafi was overthrown in 2011. 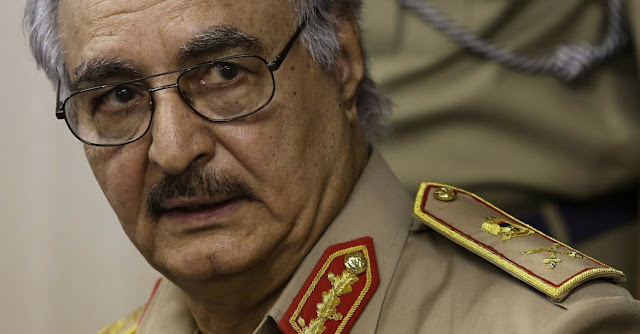 On April 5, 2019, UN Secretary-General António Guterres flew to Libya’s second city of Benghazi to meet General Haftar. Following their meeting, the Secretary-General made brief remarks to waiting journalists, saying he was leaving Libya “with a deep concern and a heavy heart. I still hope it will be possible to avoid a bloody confrontation in and around Tripoli.” Shortly afterward, LNA forces clashed with a pro-government alliance less than 30 miles (50 km) south of the capital, a GNA source said. 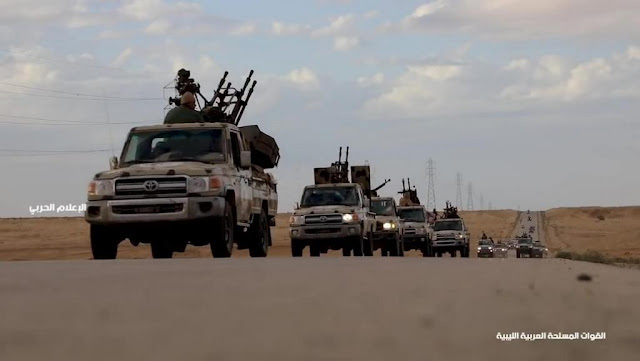 Image Attribute: Screengrab from video published by Haftar's LNA supposedly shows military convoy heading towards Tripoli, April 3, 2019. On April 6, 2019, the United Nations Security Council (UNSC) and the G7 have called on the LNA forces to halt their advance and stop any further military escalation, but this is highly unlikely, as the LNA is within striking distance of the capital and currently possess the momentum on the battlefield. On April 7, 2019, fighting was underway at the non-operational Tripoli International airport, located in the area of Qasr bin Ghashir, 15 miles (24 km) from central Tripoli. Hafter said his forces had launched airstrikes targeting rival militias on the outskirts of Tripoli. In a press release (dated April 7, 2019), US Marine Corps General Thomas Waldhauser, commander, US Africa Command (USAFRICOM) said, "The security realities on the ground in Libya are growing increasingly complex and unpredictable." He further added, "Even with the adjustment of the force, we will continue to remain agile in support of existing U.S. strategy." As of today, on behalf of the Trump administration US Secretary of State Michael Pompeo issued a stern warning to Haftar to halt his forces advance on Tripoli, and urged all sides to continue with political negotiations.